That Dam Problem in Caledonia. The manager of the LaBarge Dam often closes the gates to recharge the impoundment at 84th street, resulting in instant lowering of water level downstream by as much as two feet. The lowered levels reach almost all the way to the Cascade dam impoundment. Observers have noted stranded fish and many dead aquatic insects when this occurs. This is very damaging to the river ecology at this stretch. The dam has been reported to be operated at "run of the river" levels, but this photograph documents that this is not true. Run of the river does not result in such drastic and abrupt changes in water levels. Commonwealth Power of Okemos, Michigan, operates three dams on the Thornapple River. For the past several years, FERC (Federal Energy Regulatory Commission) and the Michigan Department of Natural Resources have blocked license renewal for these dams. At present, Commonwealth has permission to continue operations. Commonwealth Power spokespersons have informed the community that the DNR has apparently been abusing their power in what seems to be an attempt to put the dams out of business. When the DNR required study after study by Commonwealth, and refused to renew the required certificates, Commonwealth finally took them to court, as the studies were not specified by law. The judgement by Ingham County Circuit Court (judge W.E.Collette) maintained that the DNR "has not properly promulgated rules governing the grant or denial of water quality certificates," and ordered the DNR to issue the certificates. To date, the DNR has not issued the certificates, and has appealed the decision. Who is paying for all this litigation??? Commonwealth Power, and the citizens of Michigan. Your tax dollars are at work, here, my friends. Do you like it? Residents have built their dream homes along the banks of the river, to enjoy the natural beauty and recreation. The community is NOT in favor of removing the dams, whether or not they know that this is a healthy move for the river. The existing ecosystems are at risk, even though they are artificially created and maintained by the dams. If the dams were removed, people who live on the impoundment lakes would have their view changed from waterfront to one of gooey silt, then to brushy vegetation, and the river would be navigable only by canoes and kayaks. If the dams were removed, the mess of cleaning up a 50 year collection of silt would have to be dealt with, and at whose expense? 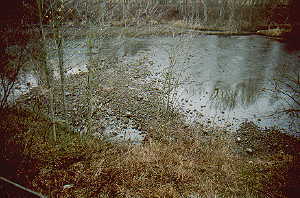 What kinds of toxic chemicals are in that silt? How badly will the released silt damage the bottom habitat of the river downstream from the dam? If the dams are removed, residents ask: Is there any hope for the slightest control of water levels during floods? If you are a Caledonia or Thornapple River resident, and you want the most recent info on this issue, contact us at the email address on this page. The TRWG has been assured by public officials that the dams will remain in place for now. EPA data on the impoundments on the Thornapple River.